The Sabre armchair is designed by Brazilian architect Carlos Motta. This piece was designed in the 1993 for the 3rd Studio International Imaging Technology, UNESP University in Sao Paulo. 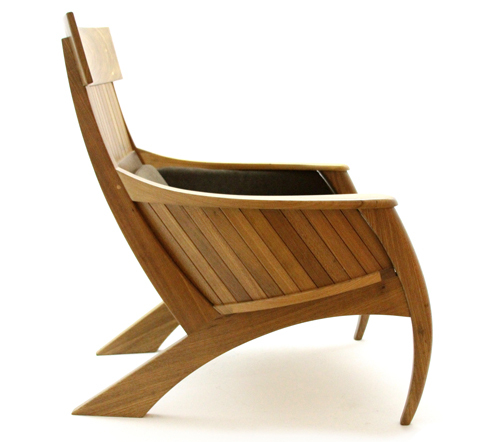 The chair is the result of a masterly wood manufactory created in the workshop of Carlos Motta. The solidity of the wood belies the ergonomics of the seat. This piece represents just one of a largest range housed the UK outpost of ESPASSO, the US specialists in Brazilian design. The collection is hosted in the new showroom and exhibition space within London’s homonymous area at 19 Greek st. Opened 13 September, this six-floor gallery has ambitions to become the new design hub for the city, with a range of commercial and non-commerical pieces from the most dynamic cities of the world, from New York to Rio.